In the early development of the fetus, some creatures have an anatomic plan with a supportive notochord. This notochord consists of simple nervous system and sense organs, segmented muscles blocks and a series of branchial clefts supported by cartilage to permit gaseous exchange. Cartilaginous blocks and cartilaginous capsules derived to support the notochord in the head region and protect the sense organs there. These cartilages and other cartilages form together the Neurocranium. The cartilages that support the branchial arches are known as the Viscerocranium. The Neurocranium and Viscerocranium together form the chondrocranium. After the formation of the neural tube by the fusion of the neural fold, the neural tube starts to expand interiorly to form the forebrain, midbrain and hindbrain that develop a series of 8 bulges, the rhombomeres. Lateral to the neural tube is paraxial mesoderm which differentiates rostrally to seven somatomeres and caudally to somites. Neural crest cells arise from the midbrain and the first two rhombomeres to give the connective tissue needed for the craniofacial development. Every branchial arch has the same components. The inner surface is covered by endoderm and the external surface is covered by ectoderm. The central core consists of mesenchymal cells derived from neural crest. The neural crest mesenchyme condenses to form a bar of cartilage known as the arch cartilage. Some of the mesenchyme surrounding this cartilage develops into muscles. Also each arch contains an artery and a nerve. Early development of the face is dominated by the proliferation and migration of ectomesenchyme involved in the formation of primitive nasal cavities. 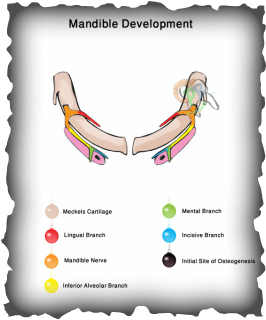 The lateral arm of the horseshoe is called the lateral nasal process, and the medial arm the medial process. The medial nasal processes of both sides, together with the frontonasal process, give rise to the middle portion of nose, upper lip, anterior part of maxilla and the primary palate. The maxillary process grows medially and approaches the lateral and medial processes but remains separated by the naso-optic groove and bucconasal groove. The upper lip is formed from the maxillary processes of each side and the medial nasal process, with fusion occurring between the forward extent of the maxillary process and the lateral face of medial nasal process. The lower lip is formed, by merging of two streams of ectomesenchyme of the mandibular processes. The merging of the two medial nasal processes results in the formation of part of maxilla carrying the incisor teeth and the primary palate and part of the lip. The face develops between the 24 and 38 days of gestation. By this time some of the epithelium covering the facial processes already can be distinguished as odontogenic. On the inferior border of maxillary process and the superior border of the mandibular arch, the epithelium begins to proliferate and thicken. The primary epithelial band is an arch-shaped continuous plate of odontogenic epithelium that forms in the upper jaw from four separate zones of epithelial proliferation, laterally one zone associated with each maxillary process and in the middle one with each medial nasal process. Two zones, one in each mandibular process, form the primary epithelial band of the low jaw.